To make the most of the event, astronomers have planned observations with the NASA/ESA Hubble Space Telescope and NASA's Chandra X-ray Observatory, Nuclear Spectroscopic Telescope Array (NuSTAR), Fermi Gamma-ray Space Telescope, and Swift missions. "Finding and publicizing new supernova discoveries is often the weak link in obtaining rapid observations, but once we know about it, Swift frequently can observe a new object within hours," said Neil Gehrels, the mission's principal investigator at NASA's Goddard Space Flight Center in Greenbelt, Md. Although the explosion is unusually close, the supernova's light is attenuated by thick dust clouds in its galaxy, which may slightly reduce its apparent peak brightness. "Interstellar dust preferentially scatters blue light, which is why Swift's UVOT sees SN 2014J brightly in visible and near-ultraviolet light but barely at all at mid-ultraviolet wavelengths," said Peter Brown, an astrophysicist at Texas A&M University who leads a team using Swift to obtain ultraviolet observations of supernovae. However, this super-close supernova provides astronomers with an important opportunity to study how interstellar dust affects its light. 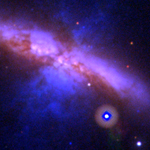 As a class, type Ia supernovae explode with remarkably similar intrinsic brightness, a property that makes them useful "standard candles" -- some say "standard bombs" -- for exploring the distant universe. Brown notes that X-rays have never been conclusively observed from a type Ia supernova, so a detection by Swift's X-ray Telescope, Chandra or NuSTAR would be significant, as would a Fermi detection of high-energy gamma rays. As a fan of the Great space Chandra Congratulate Dr. Belinda Wilkes. Her extra ordinary talents, enthusiasm and passion will add more human end-ever and more values to CXC and related fields along with NASA and all the space missions. Resent article about The Alfred P. Sloan Foundation has recognized Canadian based Waterloo professor, Dmitry Abanin, for his groundbreaking theoretical research in condensed matter physics of Dirac materials, such as graphene. So next generation of scientific leaders also will help achieve much greater things through Chandra.